Martha writes to Mary saying that she will send some literature about the work at Berry. Martha also notes an editorial she has marked in one of the Highlanders explaining why they wish the friends to correspond with the students. Martha goes on to note that every dollar is a sacred trust and is impressed upon workers and students in the school. 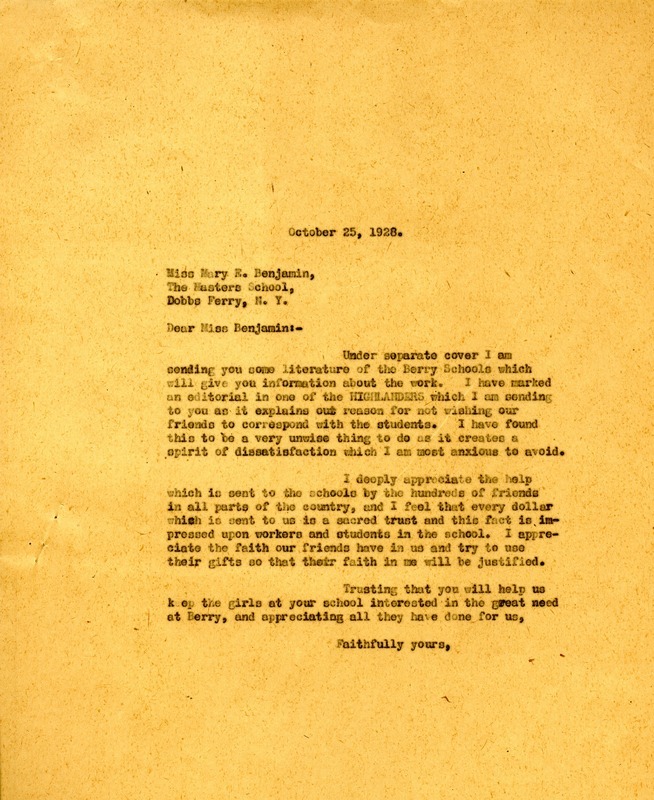 Miss Martha Berry, “Letter to Mary Benjamin from Martha Berry.” Martha Berry Digital Archive. Eds. Schlitz, Stephanie A., Rachel Renaud, Aaron Jackson, et al. Mount Berry: Berry College, 2012. accessed April 24, 2019, https://mbda.berry.edu/items/show/6653.